Andrea is a heavy-set Goth classmate of Daria Morgendorffer at Lawndale High. She was first seen in the very first episode of Daria, Esteemsters, as a member of Mr. DeMartino's history class. 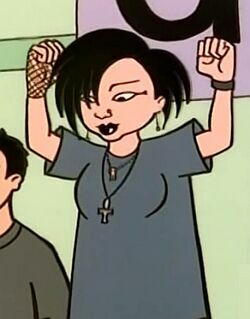 The mystery goth was an unnamed background character until the fourth Daria episode, "Cafe Disaffecto." Her name is pronounced an-DRAY-ah /ɑːnˈdreɪ.ə/ with the stress on the second syllable. 2 Andrea in "Mart of Darkness"
3 Andrea in Is It College Yet? Andrea was voiced by Susie Lewis-Lynn in seasons 1-3, then by Janie Mertz in seasons 4-5. Little is learned about Andrea during the five years that Daria ran on MTV. The tone is set in Cafe Disaffecto when we catch the end of Andrea's coffeehouse poem, which concludes "I'm here. But where are you? Sure, I see your body. Anybody home in that rotting bag of flesh?" Later in that same episode, she was seen hiding a beer bottle. The few hints we get regarding Andrea confirm her cynical outlook on life. Her locker is adorned with a skull and crossbones poster and a biohazard poster (Arts 'N Crass), and when everyone is shellshocked by their assignment in "The F Word", she's grimly doodles a coffin. She is happy to make a bet on Mr. DeMartino getting injured in the DJ/Faculty roller hockey game (and it is implied that she wins the betting pool). When Quinn foolishly tries to raise money from Lawndale High Students so she can get plastic surgery (Too Cute), Andrea asks Quinn if she's worried there might be a hell. Andrea can be often seen in the background but is very rarely hanging out with anyone - a rare exception is when she sits next to "Hot Shades" at lunch in "The New Kid" and hanging with V-Neck in the arcade "Partner's Complaint". Otherwise she seems to have less social interaction than even Daria. She was part of the yearbook committee in "The New Kid" but said not a word during it. Andrea's parents make her work at Payday (Mart of Darkness), and she's not happy about it. In (Daria's Inferno), Daria gives Andrea a cowbell to put in her nose to annoy her parents, and Andrea says: "That is irritating! Perfect." Daria's Inferno is Daria's dream, but if this is an indication of how seriously Daria takes Andrea and her goth sub-culture, it could be a reason why the two aren't friends or even acquaintances, even though they seem to have a lot in common. Daria also dreams of Andrea working for Upchuck and massaging his feet in "Murder, She Snored." Why? We don't know. The only hint of Andrea's inner life comes from cartoon strips in The Daria Database drawn by "Andrea 666" called Gothic Nights: The Adventures of Queen Hecuba. The three cartoon strips deal with Queen Hecuba (a thinner, more regal version of Andrea) vanquishing enemies consisting of Upchuck, Kevin, the Lawndale High School faculty (except Janet Barch) and Mack Mackenzie. While the reasons for her antipathy toward the others is understandable, her beef with Mack is puzzling - the other enemies are all tricked into defeat and humiliations, while "Sir Mack the Fearless" is Hecuba's "archenemy" and requires fighting. That strip ends with a spectral version of Barch arriving, which terrifies Mack into retreat and causes Hecuba to give Barch a job; this makes Barch the only teacher given a positive role in the strip. Does Andrea like Barch? In one strip, Queen Hecuba seeks to rescue her "beloved brother Damien" from an evil king. It is unclear if the unseen Damien is based on a real-life brother of Andrea's. When asked why Daria and Jane never hung out with Andrea or other unpopular characters, Glenn Eichler stated: [url=https://web.archive.org/web/20151103222903/http://www.the-wildone.com/dvdaria/glenninterviewsfull.html]line from Glenn Eichler:[/url] "Because we were trying to satirize high school, not create a comfortable alternative world where Daria and Jane could be stars among their misfit peers... We didn't want to do a show about the misfits finding happiness through solidarity. We didn't want anyone finding happiness, period." Andrea in "Mart of Darkness"
At the end of Mart of Darkness, Daria and Jane locate a clerk at Payday that seems to be avoiding them. The clerk is revealed to be Andrea, who states that she was trying to avoid Daria and Jane because she didn't want to hear them mock and "cut her up" verbally for working at Payday, a hated job imposed by her parents. However, Daria and Jane state that, as far as they are concerned, they never saw her at all. Andrea's secret is (theoretically) safe. Andrea in Is It College Yet? In Is It College Yet?, Upchuck hits on Andrea and offers to take her away from Jodie's graduation party. Andrea is amazed that Upchuck is actually trying to hit on her... and then accepts Upchuck's offer, to Upchuck's surprise. No reason is given for Andrea accepting the offer, and nothing is known about what actually happened afterward. Sometimes Andrea is given the fanon last name "Hecuba," from the Gothic Nights strip. Another popular fandom name is 'Thorne' (which may be connected to her having a brother named Damien---"Damien Thorn" is the evil child in The Omen). Some fanfic writers use both, for "Hecuba-Thorne." In the Legion of Lawndale Heroes series, Andrea's character has progressed to become a fusion of the 'swimsuit model' alter-ego seen in the closing credits of 'Is It College Yet?' and the DC Comics/Legion of Super-Heroes character Dream Girl. She has been shown as having left Lawndale after the destruction of Lawndale High, and discovering a promising career as a model (albeit not of the exacting standards needed to become a supermodel). She has also discovered that she has the ability to have precognitive visions and/or dreams that are accurate out to one year in advance of the event. This page was last edited on 16 May 2018, at 20:37.